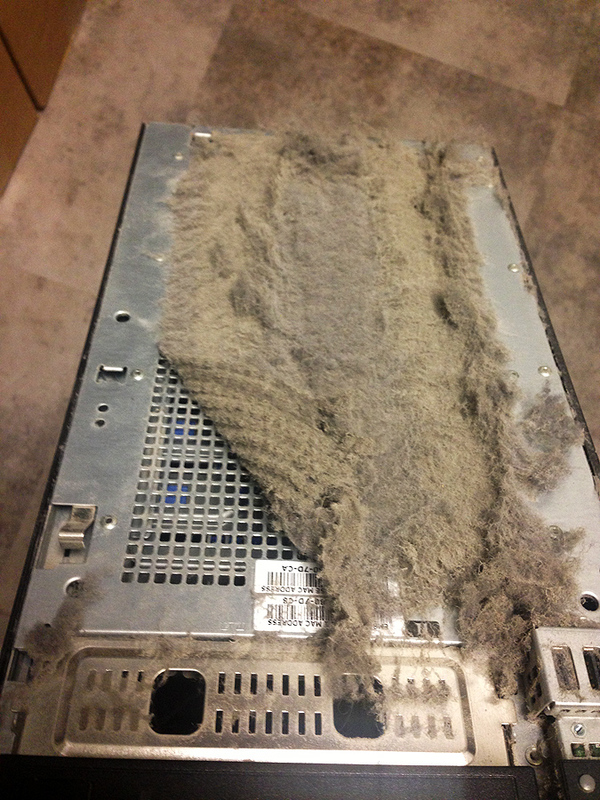 Server dust collection has always been both a concern an annoyance of mine. Proper server storage accommodations are rare for most businesses and even if properly locked away, the rooms are still vulnerable to dust depending on outside variables. I decided to eliminate the problem altogether by using a simple filter trick. All servers are configured the same way: Front air intake, rear exhaust. With the general exception of newer generation servers featuring Intel’s latest chips, most servers have anywhere between 2-12 fans with an idle RPM over 2,000-3,000. This all translates to the illustration below. To avoid cleaning internal heatsinks and fan components on a regular basis, I simply covered all air intake using standard cotton filters. Oil based filters are recommended for environments featuring machine/manufacturing debris where it is critical to keep server internals happy. 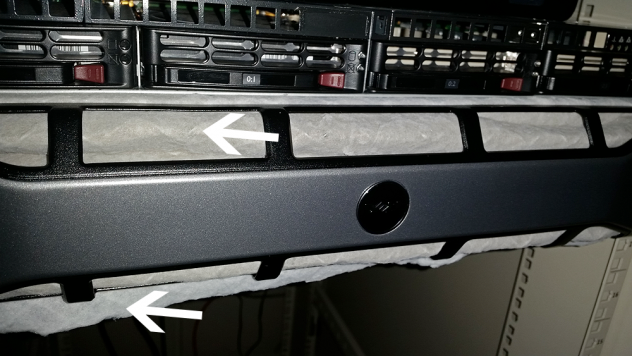 The photo below shows a server with a newer oil filter. After only one month in a relatively clean environment, it is obvious the filter is working via the color difference between the air intake and extra slack below the server. The filter below was originally the same color as the paper grid and edge. This cotton filter was applied to a clean environment for about six months. – Fan RPM with filters applied did not change value, indicating that no additional intake strain was present. – Server board and CPU temperatures over multiple tests resulted in no change, clearing the filters of any worries associated with intake loss. I don’t know about you, but I’d rather buy cheap air filters and cut them into strips of three (lasting about a year at a time) than continuously busting out the compressed air cans. 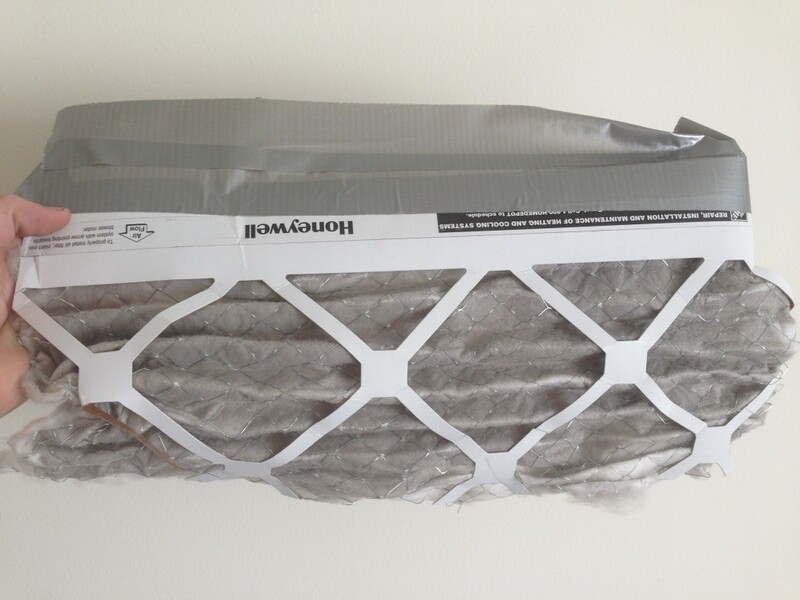 Cost, time, and downtime wise, the benefit goes to the HVAC filters.